Today's the big day for the new book. 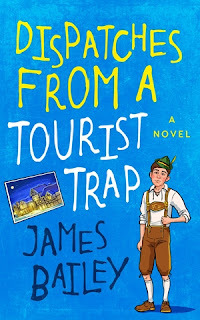 Dispatches from a Tourist Trap released today on Amazon for the Kindle. Yes! Only $2.99. A bargain at twice that. At one time last year I had hoped to release this book at the same time as The First World Problems of Jason Van Otterloo, the first book in the series. But then the reality of editing and rewriting hit and it became obvious that would only push everything back. I was also hoping that by releasing Book 1 in the fall, there would be a rabid corps of Jason Van Otterloo fans salivating for the second book by now. That hasn't quite happened. This series is more of a slow burner, I guess. We'll get there in time, but for now still building one sale at a time. I'm in my last week of unemployment before starting my new job next Monday. I've been busy, busy, busy with book stuff over the past few weeks. The top priority was getting Dispatches ready to go, but there's been a lot more going on. Yes, I have finally gotten the formatting done to release both The First World Problems of Jason Van Otterloo and Dispatches from a Tourist Trap in print. I am in the process of getting the covers created. Once those are ready I'll just need to upload my files to Amazon, order proofs, make sure everything came out right, and release. I'm hoping to have them ready for public consumption by the middle of the month. In addition to doing review copy giveaways on Library Thing and Booksprout, I had a very long, detailed review run on a site called The Irresponsible Reader. And I don't know if I really understand the name, because the guy who runs it seems quite responsible, as well as prolific in his reading. He had some nice things to say about The First World Problems of Jason Van Otterloo, and will also be reviewing Dispatches from a Tourist Trap soon. In addition to reviews, The Irresponsible Reader also runs author Q&As. Mine was posted this morning. I've done a few of these in the past, but this one was great because he seemed like he put some serious thought into the questions, instead of simply sending the same handful of questions he asks everyone else. So, plenty going on here. I keep thinking I'll wake up one day to a short to-do list and have time to lounge on the couch watching TV, but it keeps not happening. And we're down to three days of "vacation," so it's looking less and less likely. Oh, well.